She’d be confident, warm and decent. She’d be an intellectual and completely transparent about her emotions at the same time. She’d value love and friendship over money and fame. She’d be an extreme food lover. She’d eat biryani and kabab as often as puchka and egg roll. She’d never finish her meal without sweets, Sondesh and Rosogulla being her favorites. And she’d be very fond of Chinese food as well. She’d love to roam around on streets with friends and have long talks (adda) on varied topics starting from politics to books to food. In all she’d be a wonderful company. I was first introduced to Kolkata by one of my friends. The way he used to explain her I was quite impressed. I got married in a Bengali family and that was when I got to know her deeply. Finally I was almost in love with Kolkata when I heard about her from a couple from Kerala. As per them those two years that they have spent there had been the best time of their lives. It now seemed irresistible not to go there and get the feel of her myself. So I decided to go on a date with her, and the best time I thought would be when she is in epitome of romance, Puja time. The smell of moist air welcomed me to Howrah station, a place full of action. Several trains reaching and leaving the station simultaneously; Porters running here and there; people greeting their relatives; Hawkers selling stuff from Jhal moori to locks and chains to magazines. It was bustling with life. With the feeling of excitement within to meet my date whom I’ve loved in my imagination, I proceeded further. On the harbor of the river, you get plenty of time to view Kolkata’s most iconic sight. As we ferry across the water, Howrah Bridge seem personified as the handsome, muscular and stoic. It was difficult to take my eyes off it. I had not got over the magic of the beauty of Howrah Bridge when my eyes met the sensual ivory curves of the glamorous Victoria memorial. Dedicated to Queen Victoria this memorial provides an insight into Indian History right from the arrival of British to the Independence era. Amazing paintings and photographs by British officers unfold an Indian subcontinent hitherto unknown to many of us. Beyond the Memorial is the mesmerizing sweep of Maidan where you can witness the romance of life. You will find friends sharing happiness and talking their worries away, families having picnics, fitness freaks of all ageswalking and jogging, political leaders addressing crowds, kids playing, music lovers singing. 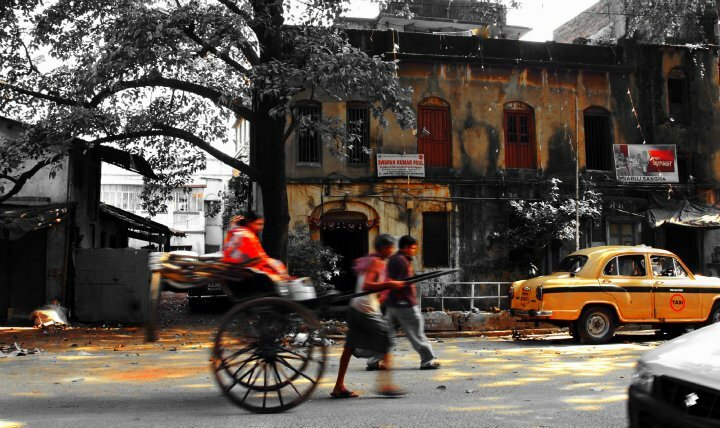 Life on the Maidan is the quintessence of life in Kolkata. Plan was to visit a friend at Sutanuti, one of the oldest settlements of Kolkata on the bank of river Ganga. Metro took us to Shobha Bazar, Sutanuti. We walked through a labyrinth of narrow streets and lanes with our friend to reach a 250yrs old Haweli. An old wooden staircase led us to a colorful verandah. 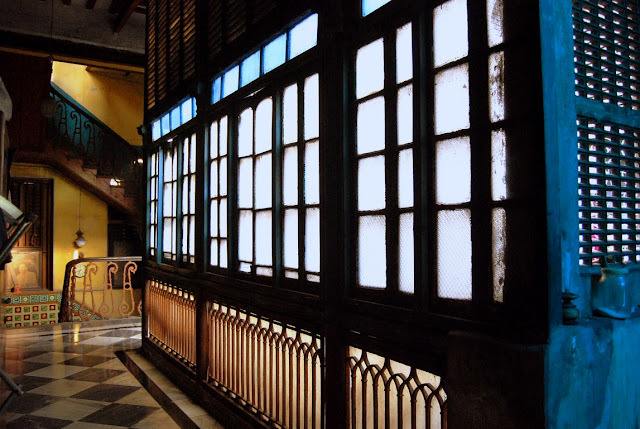 Light created an optical wonder on the floor of the verandah as it filtered through the glass windows. What would have been a better place than this Haweli to stay at to understand Kolkata in its true sense. A small talk with the host and I knew what I’ve heard about people from Kolkata is absolutely correct. Their love for art, culture, heritage and traditions was quite evident. A long drive to Diamond Harbor was planned for the next day. Drive through Kolkata roads gave me an opportunity to look at my sweetheart closely and company of friends from Kolkata an opportunity to understand her soul. And hence started my romance with this city Kolkata! Walking through Madhupal lane where people were busy having morning tea with family and having discussions on the day’s plan for puja celebrations and ladies after a fresh morning bath in Ganga waters were about to start their day, we reached Durga Charan Banerjee road. I was amazed to see old buildings in their original form. The Kolkatians’ love for their heritage was quite evident from the way they have preserved these building in their natural form. Yellow ambassador Taxis, hand pulled Rickshaws and trams can’t be seen in any other part of the country except for Kolkata. Morning chai adda was the most common scene at the road sides. After spending good time with my Kolkatian friends it was clear to me that it is a city where people judge each other on the things that really matter; where they understand that life is not about money but about culture, ideas, art, and passion. At night we walked through kumartuli (traditionally potters’ quarter in northern Kolkata) streets flanked by artisans’ workshops. While the city was busy in celebrations the artisans’ squat on the street giving finishing touches to idols ignoring the attention of curious passersby. For them making Idols of Goddess is only a means of survival. Walking through these streets we reached the banks of Hooghly River where people were washing away the fatigue of the day so they can have a peaceful sleep. Next day was dedicated to visiting Puja Pandals and finding out why there is so much of hype around Kolkata Puja. My sweetheart was decked with elaborate beautiful pandals. I wanted to understand the passion behind this madness that I have witnessed all these years in every Bengali around Puja. No work talks for a week I was told. It’s time to celebrate – new clothes, elaborate food, Pandal hopping, chai adda and lots of fun. The essence of Puja lies in culture, the warmth of being together, the joy of celebration, the pride in artistic expression. It’s all about the bonding, the emotion, the spirit and the love for life. Ah! That was my first meeting with this ‘city with a soul’. This visit has made me even more anxious to meet her once again, for a longer duration next time. With the hope of returning to my beloved soon I left Kolkata with beautiful memories in my heart!